When you’re thinking about pirates (who doesn’t think about pirates? ), odds are that you immediately think of a black flag with a skull and crossbones, also known as a Jolly Roger. While the Jolly Roger as we know it had a period of popularity with pirates, it was far from the only flag that they flew. Early pirates of the 17th century would usually fly two flags; either a plain black or red flag when they were attacking and a flag of their country of origin. The black flag signified “surrender at once” while the red signified that no mercy would be given to the crew. National flags were used to make a statement that their attacks were legal under their home country’s laws, however this was often not the case. A representation of Thomas Tew’s pirate flag. Pirates began applying unique designs to their black and red flags by the turn of the 18th century in order to terrify their victims in to obeying their commands. The flag flown by Thomas Tew’s ship, which features an arm holding a sword, is thought to be one of the first of the unique design flags. As more pirates took to this trend, other symbols such as an hour glass, signifying that you only have a certain amount of time to surrender, and a pierced heart, signifying no surrender, became popular. The flag flown by Blackbeard (Edward Teach). By the 1710s, skulls and skeleton’s became widely adopted in many variations, including a bandana-covered skull facing right or a skeleton piercing a heart. Many of the designs were placed on the red flag, inspiring the french term “jolie rouge” or “pretty red”. It is believed that this influenced the English term Jolly Roger, which came to represent most pirate flags, especially those with skulls or skeletons. A variation of the Jolly Roger with crossed swords instead of crossed bones. The Jolly Roger as we know it was popularized in 1720 when a pirate named Calico Jack Rackham was captured and put on trial. Rackham had two women in his crew and one was reportedly pregnant with his child. This sensational story quickly became the talk of England. It just so happened that Rackham’s flag was a forward facing skull with crossed swords beneath on a black field. 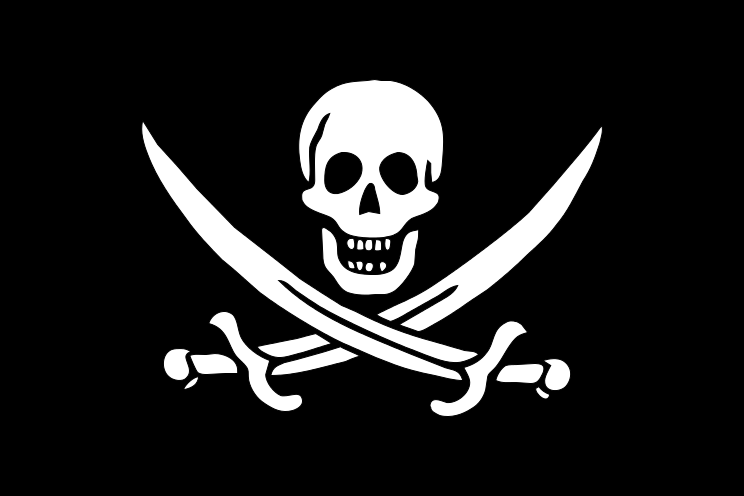 Due to the general public’s limited interaction with pirates, Rackham’s flag, and variations with crossed bones instead of swords, became their de facto symbol of pirates. The skull and cross bones have not always been a symbol of pirates. It’s first major use was in Christian art of the middle ages. Many depictions of Jesus’ crucifixion feature a skull and two bones in the shape of a “t” at the base of the cross. The skull is supposed to be that of Adam, the first human, and is meant to be a sign of rebirth and Jesus’ resurrection. A few centuries later, the symbol took on its more common meaning of death when ship captains would draw a skull next to the names of those who died on board in the ship’s log. A century or two later, pirates took to this nautical tradition to let everyone know that death awaited those who opposed them. Patch of the 3rd SS division. The Jolly Roger continue to evolve as a sign of danger and death in the 19th and 20th century. In the late 1800s, the symbol became widely associated with poison. The Nazi’s also used the skull and crossbones to represent their SS death head divisions. Today, the Jolly Roger is again widely associated with pirates, but in a much different way. A symbol that once inspired fear has gone “mainstream” and is now prevalent in everything from children’s TV shows and movies to popular clothing (I bet Calico Jack Rackham is rolling in his grave). Modern pirates, such as those who operate off the coast of Somalia, do not tend to use flags. Their boats are often very small and do not have masts or hoists to fly flags from. Even if their boats could support flags, the Somali pirates probably wouldn’t use them, as they tend to rely on surprise and ambush tactics. A special thanks to the 99% Invisible podcast. Their Episode 114: Ten Thousand Years inspired me to write this post and provided some of the information. Fun Flag Facts is in no way affiliated with the podcast.